- Title from the Detroit Publishing Co., catalogue J, foreign section. Detroit, Mich. : Detroit Publishing Company, c1905. Marken was an island in the Zuiderzee. 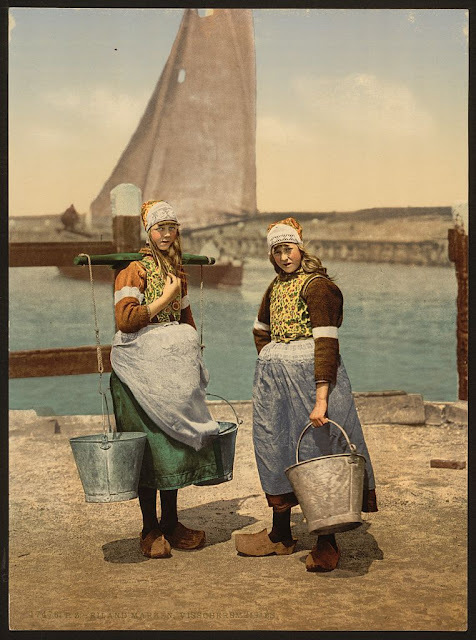 For some time during the later 19th and early 20th centuries, Marken and its inhabitants were the focus of considerable attention by folklorists, ethnographers and physical anthropologists, who regarded the small fishing town as a relic of the traditional native culture that was destined to disappear as the modernization of the Netherlands gained pace. Among them was Johann Friedrich Blumenbach who examined a skull from the island of humans which he called Batavus genuinus; and was the Belgian painter Xavier Mellery who stayed in Marken at the request of Charles De Coster. Mellery was asked to perform illustrative work and delivered several intimist works. The projects of Cornelis Lely was to incorporated the island into the Markerwaard. The dike, built in 1941 in the north, is the first phase of that project which was stopped by the war. In 1983, the Marker Museum about the history of the island was opened.